Having to follow up overdue accounts is a common part of being in business. But it’s also very frustrating and possibly fatal for your business if too many accounts are paid late and you run out of cashflow to fund your operations. But there are steps you can take to encourage on time payment of your invoices, and one of these steps is developing a series of follow up letters and emails to send to customers at different stages of the accounts receivables process. Apart from being organised and developing a simple system to follow, the wording of your letters and emails is the most crucial thing you have to get right to encourage payment of outstanding invoices. This simple communication is more like a “courtesy call” that reminds customers the payment is due soon. Generally this letter or email should be sent 10-7 days before the due date to give the customer plenty of time to ensure they have funds on hand to pay your invoice. The communication is personal and friendly and needs to come across as a favour to the clients to help them stay on top of their bills. Starting with “For your convenience” or some similar phrase will help achieve this “helpful” tome and avoid sounding “naggy”. For your convenience, I thought it would be helpful to send you a friendly reminder that payment for (invoice number) is about to be due on (date). Have a great day and thanks again for your business. If you have any questions or concerns please call or email. 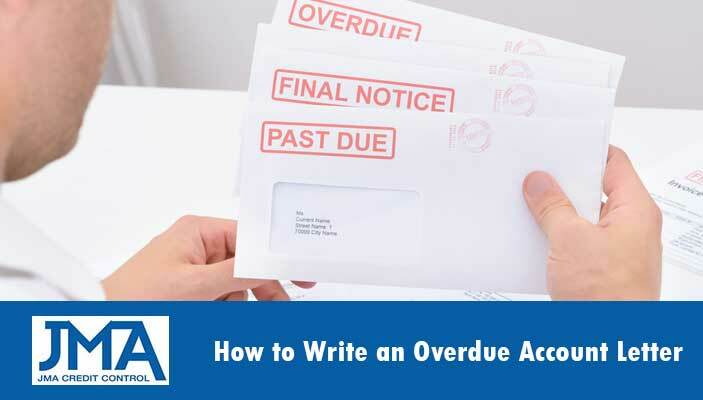 It’s important to send an “Overdue Letter/Email” the very first day the invoice passes it’s due date. This is simply good business practice, let’s your customers know that you’re aware of the late payment and overtime they will begin to expect your reminder the first day a payment is late so your invoice will generally be paid before other vendors who are less organised. This letter/email should still be friendly in tone but a little more firm and professional to let them know you are serious. In most cases late payment of only a few days is simply an oversight, so be sure to approach the subject delicately using phrases such as “your account with us now appears as past due”. When an invoice is overdue by 60 days or more, it is time to take a more serious approach. The longer an invoice is overdue the likelihood of payment (or at least full payment) reduces exponentially so you need to be diligent. During the period from when an invoice first becomes overdue and the 60-day email there you should be proactive with phone calls and emails to try to collect the outstanding balance. The 60-Days Overdue Email needs to be the next formal communication and should be much firmer and clearer about the consequences. When a payment is this late it is rarely due to the simple fact a customer is unorganised and generally indicates some deeper issue. This communication needs to include strong language with some words in bold such as “IMPORTANT” and “60-DAY OVERDUE” and “IMMEDIATE ACTION”. Be sure to include any full details of the overdue account (including fees) and add any other higher ranking contacts within the business to the email to ensure they are aware of the overdue account. At this stage you should also provide some options for a payment plan to help the client if they are currently short on cash flow. This can be the best approach which allows you to get paid in full and also maintain a good working relationship with the client. The final past due letter (sent 90-120 days after original due date) is a formal communication explaining the next step in “Immediate Payment” is not received. At this stage the likelihood of collecting full payment is rare unless you engage the help of debt collectors who specialise in extremely overdue account collection. Explain that you will be referring this debt to a collections agency which may affect their credit rating and incur even further fees and charges. Remind them of the numerous attempts to collect and their lack of action. 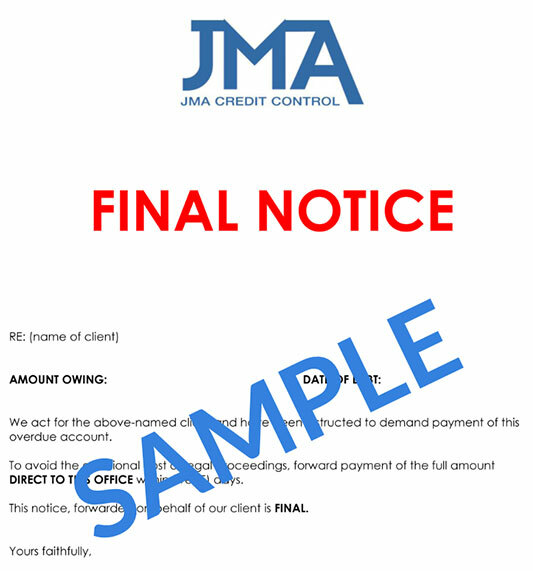 If at this stage no payment or contact is made your best option is to refer the debt to debt collection agency. Be sure to only work with an experienced and regulated agency with a long history. You can also find some firms that offer a “No Recovery – No Fee” service meaning you only ever pay if the debt collector if they recover your outstanding debt (this is usually a small % of the money they recover.